This map summarizes two and a third centuries of earthquake activity. The seismic history consists of letters, journals, diaries, and newspaper and scholarly articles that supplement seismograph recordings (seismograms) dating from the early twentieth century to the present. All of the pre- instrumental (historical) earthquakes were large enough to be felt by people or to cause shaking damage to buildings and their contents. Later, widespread use of seismographs meant that tremors too small or distant to be felt could be detected and accurately located. Earthquakes are a legitimate concern in Virginia and parts of adjacent States. Moderate earthquakes cause slight local damage somewhere in the map area about twice a decade on the average. Additionally, many buildings in the map area were constructed before earthquake protection was added to local building codes. The large map shows all historical and instrumentally located earthquakes from 1774 through 2004. Associated GIS data, compressed in a ZIP archive. Refer to the README file for more information about this dataset. The site contains regional, national, and global earthquake information and links to other sites. 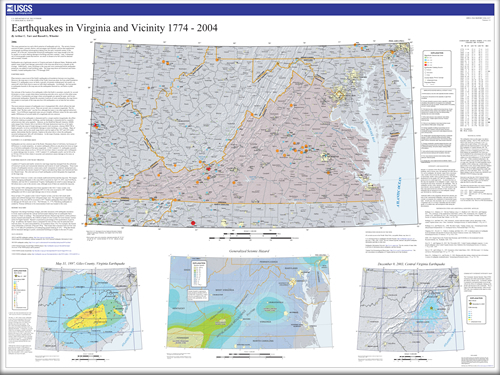 Tarr, Arthur C., and Wheeler, Russell L., 2006, Earthquakes in Virginia and vicinity 1774 - 2004: U.S. Geological Survey Open-File Report 2006–1017.